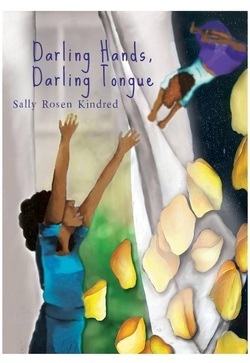 Released in 2013 by Hyacinth Girl Press, Darling Hands, Darling Tongue is a chapbook of poems that see Peter Pan's Neverland through the lens of Tinker Bell, Wendy Darling, Tiger Lily, and a contemporary mother reading the story to her sons. In Strange Horizon's 2013 in Review, Lesley Wheeler writes, "Sally Rosen Kindred’s chapbook Darling Hands, Darling Tongue revisits Peter Pan in lush, uncanny poems such as 'Notes from a Fairy Autopsy' and 'Naming the Never-Birds.' Kindred's inventiveness, and her insights into the weirdness of childhood and mothering, make for some dazzling fantasy verse." ​Poems from the chapbook appear in Diode, Strange Horizons, and Escape Into Life.